‘Fruit, small; roundish, inclining to oblong, regularly and handsomely shaped, without inequalities or angles on the sides. Skin, rich yellow, assuming a deep golden tinge when perfectly ripe, with a deeper tinge where it has been exposed to the sun; the whole surface is strewed with russety dots, which are largest on the sunny side, and intermixed with these are numerous embedded pearly specks. Eye, small and open, with long segments, placed in a shallow, smooth, and even basin. Stalk, from half-an-inch to an inch in length, inserted in a pretty deep cavity. Flesh, yellow, firm, crisp, very juicy and sugary, with a brisk, vinous, and particularly fine flavor.’ [Hogg p.95/1851]. ‘One of the oldest and by far the most highly esteemed of our dessert apples, and neither the Borsdorffer of the Germans, the Reinette of the French, nor the Newtown Pippin of the Americans, will ever occupy in the estimation of the English the place now accorded to the Golden Pippin. It is also an excellent cider apple. The specific gravity of its juice is 1078. It is in season from November to April. The tree is a free and vigorous grower, but does not attain a great size. It is also an excellent bearer. When and where the Golden Pippin was first discovered, are now matters of uncertainty; but all writers agree in ascribing to it an English origin, some supposing it to have originated at Parham Park, near Arundel, in Sussex. Although it is not recorded at so early a period as some others, there is no doubt it is a very old variety. It is not, however, the "Golding Pippin" of Parkinson, for he says "it is the greatest and best of all sorts of Pippins." 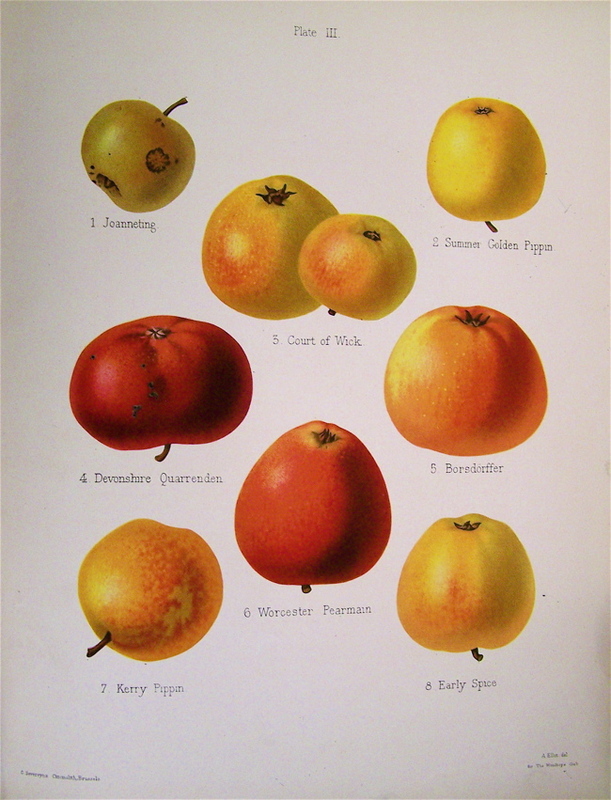 It was perhaps this circumstance that led Mr. Knight to remark, that from the description Parkinson has given of the apples cultivated in his time, it is evident that those now known by the same names, are different, and probably new varieties. But this is no evidence of such being the case, for I find there were two sorts of Golden Pippin, the "Great Golding,"' and the "Small Golding, or Bayford," both of which are mentioned by Leonard Meager, and there is no doubt the "Golding Pippin," of Parkinson, was the "Great Golding." Whether it was because it was little known, or its qualities were unappreciated, that the writers of the I7th century were so restrictive in their praises of the Golden Pippin, it is difficult to say; but true it is whilst Pearmains, Red Streaks, Codlings, and Catsheads, are set forth as the desiderata of an orchard, the Golden Pippin is but rarely noticed. Ralph Austin calls it "a very speciall apple and great bearer." Evelyn certainly states that Lord Clarendon cultivated it, but it was only as a cider apple: for he says "at Lord Clarendon's seat at Swallowfield, Berks, there is an orchard of 1000 Golden and other cider Pippins." In his Treatise on Cider he frequently notices it as a cider apple; but never in any place that I can recollect of as a dessert fruit. In the Pomona, he says, "About London and the southern tracts, the Pippin, and especially the Golden, is esteemed for making the most delicious cider, most wholesome, and most restorative." [Hogg p.96/1851]. ‘The Golden Pippin, one of the most celebrated and esteemed apples of this or perhaps any other country, has been considered by some of our modern writers on pomology to be in a state of decay, its fruit of inferior quality in comparison to that of former times, and its existence near its termination. I cannot for a moment agree with such an opinion, because we have facts annually before our eyes completely at variance with such an assertion.’ [George Lindley – Orchard Guide p.19/1831]. ‘A small round apple, much esteemed as a dessert fruit.’ [David Crichton. NHM vol.1 p60/1864]. The illustration used here is of the ‘Summer Golden Pippin’. I have found no contemporary image of ‘Golden Pippin’. [HP pl.III/1878]. Listed as apple no.59 with no description in one of William Macarthur’s gardening diaries but nowhere else that I have seen. [Diary B, 1862, MP A2951].